'Margaret Thatcher, born on 13. October 1925, was British Prime Minister from the British Conservative Party during the period from 1979 to 1990 and who had a leadership style that gained her the nickname ' The Iron Lady'. With her Sun in Libra and the Moon in Leo, she was a regal and obstinate leader. One of the most outstanding features of her birth chart is the planet Saturn rising in her ascendant in the East in the sign of Scorpio. This caused her to be perceived as uncompromising and unyielding in many cases. In April 2008, Thatcher's age point passed into a five-year period ruled by the sign of Gemini. In her birth chart Mercury is in a vulnerable position and in that year it was known that she had become dement. 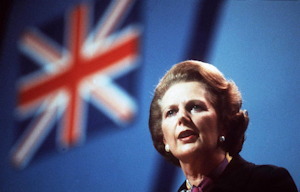 Margaret Thatcher is now over 87 years old, and her situation is fragile. Any changes in the near future point in the direction of her going to a better place'. The fact that she passed on, on April 8. proves judgement to be right on the spot. I should point out regarding the prediction, considering her illness and the improvement of quality in her chart, her illness looks more like 'death' and her death more like a 'release', so I chose to express this as 'coming to a better place', which I believe is to be the case. Very profound & interesting to read! Do you have the time of her death? Kudos to you Andrew!! Congrats that's great!! I know alot of people did not like Maggie thatcher, but I did, I thought she had a lot of guts and determination for which I admired her for!! Plus, I have Libra Sun and Leo Moon, however, I have Venus on Asc , instead of her Saturn, and my Sun 15 from Asc in 1st. Keep it up Andrew what is your take on the North Korean incident and Kim Jong Un? No I do not have the exact time of her death/exit/transition. It could be that one of Skyscript's UK-based members stand a better chance on picking up on that information. It still feels difficult to talk about the matters of death and I think the subject should be treated with some caution. Hovever, this could be one of the areas in which the human race is apt to do bounds of leaps in understanding in the coming era - and then maybe we will feel more comfortable. I think Alzheimer's is a terrible disease and it is a pity that people may be brought to such a state of disorientation, humiliation and dependency toward the end of their lives. But maybe we will understand more about this in the future, too. Thank you for your comments. The situation in North Korea and Kim Yong Un is debated in at least three other threads at Skyscript, and we can continue the discussion on this subject at either of these places. According to Sky News she died at about 11.00 BST at the Ritz in Central London where she had been staying since January following a minor operation. Her children Mark and Carol say that she died peacefully after suffering a stroke. The chart for this moment shows the Ascendant in 16�29 Cancer. The Moon is 25�04' Pisces and in the 10th (!! ), separating from Mercury in his detriment and fall. The Sun is 18�44' Aries and in the degree of his exaltation, which is 18AR56 (the square root of 360�) to be exact. What is the story behind Downing Street No.10? Is it coincidental, or does the No.10 have special tradions of dignity in Britain? Is the date a typo? Margaret Thatcher was born on 13. October, not the 19th. Which day did you use in your prediction? Thank you ea! I could really do with the proof-reading! Thank you for posting up her time of death. As you say the Sun was in his exact degree of Exaltation,interesting to note that Her natal sun is almost exact in Fall. That is the home of the Prime Minister, so she lived for for the length of her "reign". PallasAthene - I know that bit, but thanks all the same. The question was whether there were any British tradition connecting this address to the elevation of the 10th house in astrology and its signification of the Government or ruler of a country? And The Treasurer lives at No. 11, which makes sense for 11th house as he holds the nation's money. I think it hurt her greatly to be ousted by her own Cabinet and she was filmed with red eyes, clearly having been crying (the Iron Lady!) when she left No.10. Perhaps her heart and mind and memories never really left that place. Moon in 10th is also a public place and she died in a hotel, not at home or hospital, which is most people's experience? The film of her life was very sad and clearly showed the devastating effects of Dementia. It was more a study of the illness, I felt, than her biography. You have shown the onset with your method. I was going to ask if it's in the natal, but you've shown the promise of the chart coming to fruition. I was wondering if you can look at a natal chart and see tendencies to certain illnesses but it's more complex than that and you have shown it clearly. Thank you. Excellent work! It's a pleasure to be acquainted with you.